One of the most important books in the history of Medieval philosophy, the "Book of causes" was composed in Bagdad in the 9th century mainly from the Arabic translations of Proclus' "Elements of Theology". It was translated from Arabic into Latin (in the 12th century) and from Latin into Hebreuw (in the 14th century). The exceptional discovery of over several unpublished commentaries (mainly in Latin) on the "Book of causes" and the "Elements of Theology" prove, for the first time, that the two texts were widely disseminated throughout many of the European universities (Paris, Oxford, Erfurt, Krakow, Prague). The research goal is to provide partial or complete editions of the newly-discovered commentaries, and yields, through historical and philosophical analyses, new and essential insights into the influence of Greek-Arabic Neoplatonism in the Latin and Hebrew philosophical traditions until the sixteenth century. Our research on the fortune of the "Book of causes" explores several major traditions of philosophy: Greek Neoplatonism transformed and recomposed in Islamic countries, translated and received in the Western universities as work related to the "Metaphysics" of Aristotle. The main goals of our research project is to provide new informations and research tools on the Medieval Latin commentaries transmitted in Medieval manuscripts, unknown or less studied in the field. In order to accomplish this task, the first stage of our projet consists in training PhD students in the reading of Medieval manuscripts. 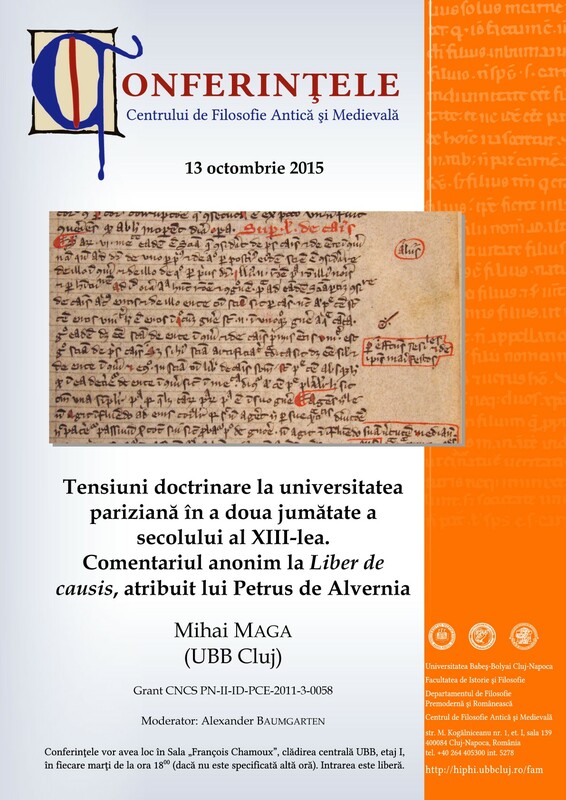 The Center for Studies of Ancient and Medieval Babes-Bolyai University of Cluj-Napoca provides the conditions necessary to form a team of young researchers; its members, under the direction of Alexander Baumgarten, publish for over 10 years, many translations into Romanian of medieval Latin texts.